So, one thing I’ve learned since writing up these recipes for Escape Club is that you guys tend to like the super rich and decadent chocolately ones the best. 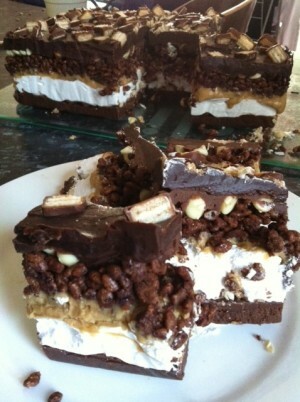 So when a friend suggested over Facebook (*waves to Deb*) that I give Chocolate Lasagne a go – who was I to refuse? 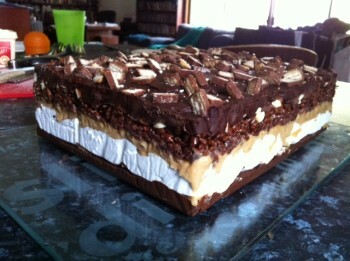 There’s heaps of recipes out there online, but I decided to go with my own invention. 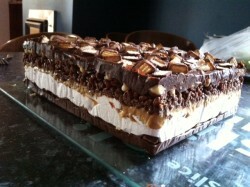 The only tip I stole was to use instant pudding for some of the layers… read on and you’ll see how that went! So hopefully, with all my trial and error, I’ve saved you the drama, and even though this is a time consuming dessert to make (that time is chilling between layers, not actual work), it’s really simple when broken down into steps. Grease and line a tin with baking paper. Be careful with this step, and make sure you’ve lined the tin well. I used a cake tin measuring 22cm x 28cm and 7cm deep. You don’t need to make yours as mammoth as mine, but do make sure your tin is deep enough for all the different layers. Melt 50g of butter with a 395g tin of condensed milk. Stir constantly over a low heat – you can’t leave it or you’ll burn the pot. Once the butter and condensed milk are combined, add 400g of finely chopped dark chocolate. Continue stirring until all combined and thick. Then carefully spoon the mixture into the bottom of your prepared pan, making it as level as possible. I added sliced ‘Chomp’ chocolate bars sprinkled on top for texture. Chill in fridge while you prepare the next layer. Is marshmallow! Add 2 tablespoons of gelatine to 1 ½ cups of boiling water. Stir until combined. Place 3 cups of sugar in a large mixing bowl, and add the dissolved gelatine mix. Mix with an electric beater for at least 5 minutes, until light and fluffy. Add a couple of drops of vanilla essence, and mix for another couple of seconds. If you wanted to add some colour, now is the time to do that, too. Spread carefully over the top of your chilled chocolate fudge and chill again. You’ll most likely have waaay too much marshmallow, so use your leftovers by spooning into a greased cake tin (you’ll use it another layer). Is caramel. Now, I’d planned to cheat here and use the tinned version, but didn’t have enough. So I made my own like this: Add 200g of butter to 200g of brown sugar in a small saucepan. Heat slowly and stir constantly until they combine to a smooth paste. Then, add a 395g tin of condensed milk and keep stirring for about 5 minutes, but don’t allow the mix to bubble. Cool at room temperature for about half an hour (or if you’re impatient like, me – 10 mins in the fridge). It’s important your caramel is cool so it doesn’t melt the marshmallow when you spread it over the top. So, this is where my problems started. I’ll spare you the details, but let’s just say I tried using instant chocolate pudding. It was a disaster and I had to scrape it off the caramel (which I’d allowed to set well, thank goodness) and start again. I started with about a cup and a half of leftover marshmallow, to 2 tablespoons of butter. Melt together in a medium saucepan over low heat. Once combined, add 2 tablespoons of cocoa and continue stirring. Pour mixture over 4 cups of Coco-pops, and mix really well until the Coco-pops are covered. Press firmly into your tin with the back of a spoon, over the top of the caramel layer. Then, just because too much chocolate is never enough, I sprinkled white chocolate buds over the top. Now, when I make this again, I’ll probably leave this layer out, but it’s up to you how much is enough, or how rich you like your decadent desserts. I added a thin layer ofmilk chocolate ganache by mixing 250g of milk chocolate with 3 tablespoons of cream and heating over a low heat until the chocolate is melted and combined. Is the same as the first! 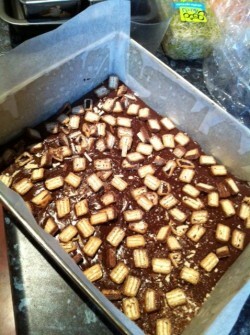 Yes, more dark chocolate fudge, and more sliced Chomp Bars for decoration. Allow your finished Chocolate Lasagne to set for a couple of hours before turning out of the tin (VERY carefully – and this is where you thank me for reminding you to line that tin well). You might need to give it a bit of a tap on the bottom, to coax it out, but be patient. Slice with a very sharp knife. You could serve this with whipped cream – but honestly, you probably won’t need it! Now… time to go for a run. Or do some sit-ups. Or something. Mmm this looks absolutely delicious!! Hi Charisma, I think Mandy said it was the richest dessert she’d ever made!